Whether the world’s 20 largest economies embrace responsible climate action is critically important, because they account for roughly 80 percent of global greenhouse gas emissions and global GDP. In this G20 Climate Progress blog series, WRI researchers and partners examine the strides these countries are making and the challenges they have yet to overcome. As the world’s fifth-largest emitter of greenhouse gases and the largest contributor of forest-based emissions, Indonesia’s success in achieving its national climate pledges will be critical to keeping the planet’s temperature rise well below the 2 degrees C (3.6 F) threshold called for in the Paris Agreement. Almost one year has passed since Indonesia submitted its first national climate action plan, or Nationally Determined Contribution (NDC), to the United Nations. In it, the country pledged to reduce its Greenhouse Gas (GHG) emissions by 29 percent by 2030 against a business-as-usual baseline scenario, and up to 41 percent subject to international assistance and financial support. The recent WRI working paper, "How Can Indonesia Achieve its Climate Change Mitigation Goal? An Analysis of Potential Emissions Reductions from Energy and Land-Use Policies," is the first independent study to examine the mitigation potential of Indonesia’s existing policies in the land-use and energy sectors to achieve these ambitious emissions reduction targets, which together account for 80 percent of Indonesia’s emissions. It also evaluates strengthened measures Indonesia can take to drive deeper reductions. Three highlights from the paper emerge. 1. 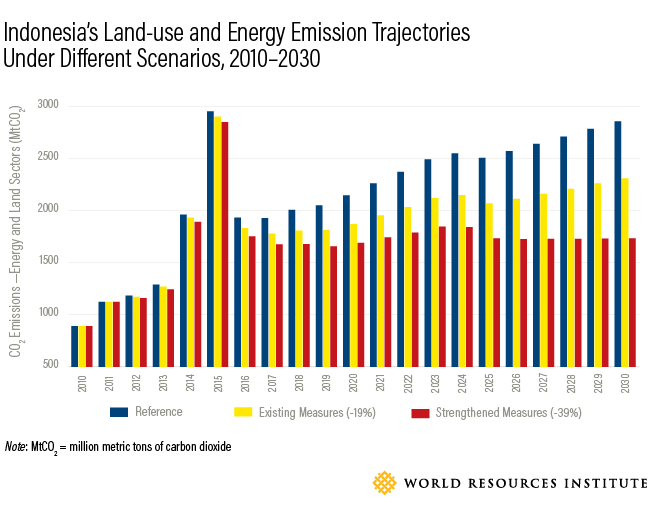 Indonesia can meet its emissions target if it strengthens existing policies. From former President Susilo Bambang Yudhoyono’s initial move to voluntarily reduce Indonesia’s greenhouse gas (GHG) emissions by 2020, to President Joko Widodo’s furthered commitment to a 29 to 41 percent reduction by 2030 in the NDC, Indonesia has increasingly stepped up its efforts against climate change. The 2015-2019 national development planning document set out several climate mitigation and adaptation targets, which the provincial governments translated into domestic targets for climate action. Additionally, the Indonesian government has increased budgets for climate mitigation and adaptation efforts, as well as introduced fiscal policies to reduce emissions in energy and land-use. Despite these efforts, our study finds the carbon dioxide (CO2) mitigation potential of these national policies and regulations in the land-use and energy sectors―including a moratorium on new forest and peat land concessions, peatland restoration, renewable energy mix targets, social forestry and degraded forest land rehabilitation―does not go far enough to meet Indonesia’s climate commitments. The quantitative analysis indicates that these existing measures would reduce emissions to approximately 2.3 Gigatons of CO2, overshooting the 2030 target of 2.0 Gigatons. Yet existing policies in Indonesia are a good starting point, and strengthening and extending them could have significant emissions abatement potential. Options could include continuing the forest moratorium policy through 2030 and expanding it to include secondary forests and forest areas under concession licenses; restoring an additional 4.6 million hectares of degraded forest and peatland; and implementing energy conservation policies. Together, such actions could reduce 20 percent more carbon emissions than current policies, resulting in approximately 1.7 Gigatons of CO2 emissions in 2030. Successful implementation could lead Indonesia to meet its 29 percent reduction target and could have the potential to achieve even the 41 percent target, depending on what happens with other sectors and gases. 2. 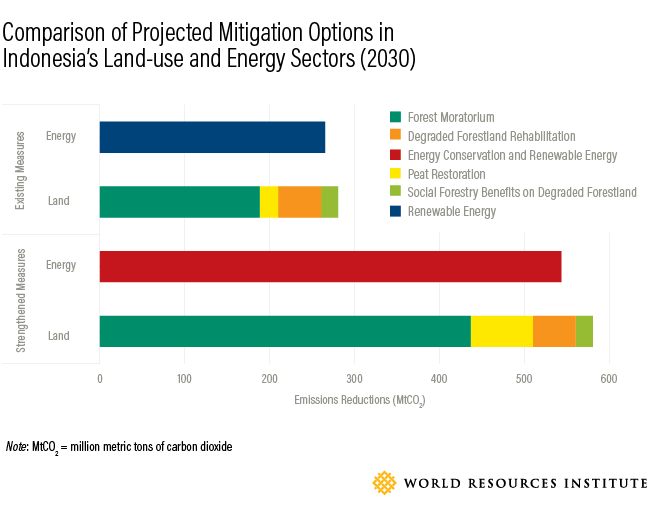 Indonesia’s forest moratorium policy has the largest mitigation potential. The study indicates that Indonesia’s forest moratorium policy has the largest mitigation potential overall. If implemented well and continued through 2030, stopping the clearing and conversion of primary forest and peatlands could avoid 188 million metric tons of carbon dioxide emissions by 2030. Further, if the current moratorium is extended to include secondary forests and removes exemptions for existing licenses, the benefits will double, with 427 million metric tons of carbon dioxide emissions cut by 2030. 3. The energy sector will start to dominate Indonesia's carbon emissions in the next decade. 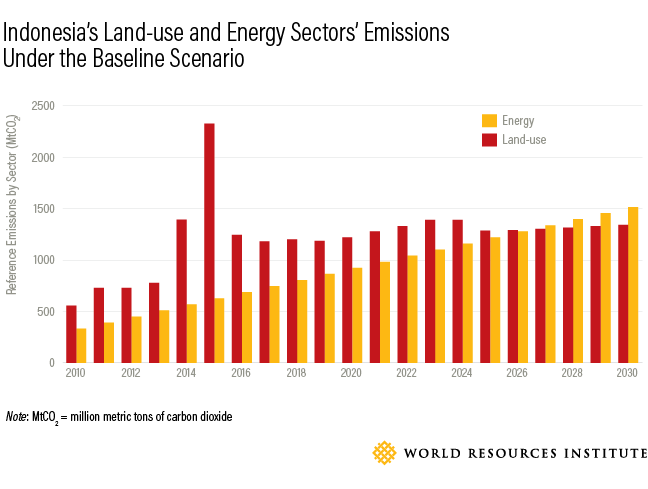 Although Indonesia’s land-use changes and peat fires are the two largest contributors to the nation’s carbon emissions, other factors affect the equation. The country’s projected population growth and growing economy will drive increased energy consumption. In turn, WRI finds the energy sector is likely to become the highest contributor to carbon dioxide emissions sometime between 2026 and 2027. This means that it is time to consider the mitigation potential of other sectors outside of land-use. Promoting a renewable energy mix target will require multiple policy directions, including, for example, a carbon tax on fossil-fuel power plants, replacing new development of coal power plants with clean and renewable energy sources (wind or solar), and providing subsidies and better feed-in tariffs for promoting renewable energy sources. In addition, energy conservation efforts need to be in place in anticipation of the increased energy demand. To achieve its climate targets, Indonesia needs to give priority to full implementation of the key existing land-use and energy policies and start to implement more ambitious mitigation actions. The prerequisites for accomplishing these strategies are transparency and good governance. Acknowledging that climate change is a multidimensional, cross-sectoral issue will allow better vertical and horizontal collaboration not only between government agencies, but also in coordination with businesses and civil society. Finally, an approach that prioritizes a commitment to action, institutionalizes climate change measures at the national and local level, and establishes concrete collaboration to scale such efforts could lead to real progress, and position Indonesia as a leader in both sustainability efforts and economic development.